Nearly two decades ago, in the fishing town of Rathgama, south-west in Sri Lanka, a young boy started playing cricket in the beach. Despite his mother&apos;s protests the boy would rush to the beach every day after school to enjoy a game of cricket. The boys played tennis ball cricket in the sandy beaches against the sea breeze. To bowl quick in these conditions, the boy had to adapt his action and develop a strong upper body. Within 3 years time from that time, Lasith Malinga broke into the Sri Lankan national team. What lessons can the Tigers camp take away from the Sri Lankan model to produce the likes of Malinga or Vaas? Jeeshan Mirza provides some valuable insights studying the successes of his resident team. On the 18th of October 2011, Sri Lanka took on Pakistan in the first of a three match test series in Abu Dhabi. Sri Lanka was fielding an exciting debutant by the name of Nuwan Pradeep. Pradeep who had an unorthodox action was known to be able to bowl at 150kph. Media and the fans were not shy about making comparisons with Malinga. Sri Lanka batted on Day One. The second day, when Pradeep finally got to bowl his first ball, was incidentally his 25th birthday. As he strode in to deliver his first ball it was another milestone for the fast bowling unit of Sri Lanka’s Centre for Excellence. Pradeep didn’t have much luck in that UAE series, nor did he enjoy any success in the recently concluded Test series against Pakistan at home. But what was impressive about this is how well Sri Lanka fast tracked a player who only held a leather ball for the first time when he was 20 years old. Pradeep is a recent addition to a growing list of promising pace bowlers with which Sri Lanka has been blessed in recent times. The list includes established bowlers like Nuwan Kulasekara, Thilan Thushara, Dilhara Fernando, Chanaka Welegedara, Dammika Prasad as well as all rounder’s like Farveez Maharoof, Thisira Perera, Angelo Matthews, and emerging bowlers like Isuru Udana, Shaminda Eranga, Suranga Lakmal to name a few (I have not even mentioned the Under 19 prospects). Don’t think these Sri Lankan bowlers are world class? Then let me remind you about Chaminda Vaas and Lasith Malinga. With 400 wickets in ODI’s, and 355 wickets in Tests, Chaminda Vaas has retired as one of the best pace bowlers not only in Sri Lanka but in the world. Lasith Malinga may have only played one third of the matches Vaas had, but in this short time he has established himself as one of the best limited over fast bowlers in the world. His slingy action, toe crushing yorkers and funky hairdo inspire youngsters around the World. In the past Sri Lankan bowling has always been about Muralitharan. Spin has been their key strengths, and they were famous for making turning tracks at home. So how have they produced so many quality pace bowlers in the last decade or so? How have they produced world class fast bowlers like Vaas and Malinga? Sri Lanka possesses one of the most organized school cricket systems in the world. Most schools have their own grounds, practice wickets, and qualified coaches. There are age groups in each school which means that the senior team is continuously fed with young talent from junior teams. Schools also prefer to play the longer version of the game which helps to develop strong basics. Local cricketing authorities have even gone to the extent of shunning T20 format in school cricket as they believe it spoils the cricketer’s basic skills. School cricket also gets plenty of coverage and following. In fact, one of the most anticipated sporting events in the country is a 3 day match between two leading schools (Royal & St Thomas) which is considered second-longest uninterrupted cricket match series in the world (Older than Ashes, started in 1879). High profile matches like these put youngsters into the spotlight right away. This provides Sri Lanka the perfect platform to develop young talent. Most of Sri Lanka’s top cricketers are products of school cricket system. To promote fast bowling, authorities have started to develop bouncy sporting wickets from school level. In 2011, Sri Lanka Cricket has even made a rule in school cricket-than fast bowlers must use the new ball in first ten over’s (To counter a growing trend of bowling spinners early). Such is the depth at which the cricketing body goes to, to develop pace bowlers. Sri Lanka has not produced all these pace bowlers by accident or luck or from a golden generation. They have come through their pace academy and the hard work and perseverance of numerous fast bowling coaches like Rumesh Ratnayake, Champaka Ramanayake (Former Bangladesh bowling coach), and current coach Anusha Samaranayake . They have worked in continuum since late 1990’s from the fast bowling unit of Sri Lanka Centre of Excellence. Before this unit was set up, promising fast bowlers used to be sent to MRF Pace Academy for two to three weeks of training. The think tank than realized there is not a lot a bowler can learn in two weeks, and there is no use sending bowlers to Dennis Lillee and co unless there is someone following up on the players development. This resulted in the formation of a fast bowling academy, which is now a part of their centre of excellence. The unit scouts for young talent from around the country then recruits those who pass the fitness and technical test (Aged 19-23). The youngsters are trained five days a week and are given food, accommodation and clothing. They are given strong grounding on the basics and introduced to swing, reverse swing, variation etc. The unit also has its own fitness coach whose aim is to keep the bowlers in prime, physical condition. Apart from working on technical and physical skills, the coaches put in a lot of emphasis on the development of mental and psychological attributes. The unit believes mental skills are imperative to help a bowler succeed in the flattest of all wickets which may provide no assistance whatsoever. This intelligence is clearly visible in all of their pace bowlers: from Malinga to Kulasekera to Matthews. Angelo Mathews with his modest pace and limited skills once ripped apart India in a flat track with a career best return of 6 for 20. Recently Thisira Perera has also destroyed Pakistan in an ODI match with a 6 wicket haul. Now these guys don’t have the pace, bounce and swing of bowlers like Brett Lee or Steyn or Hilfenhaus. But they know how to read batsmen; they know what to bowl, where to bowl-their strategy is all about intelligence. Already they have shown they can knock down and top quality batting sides like India in flat sub continental wickets. Successful trainees of the fast bowling unit are introduced into the A team and some are fast tracked to the national team. The unit has been credited for the development of Lasith Malinga, Kulasekara and the numerous emerging pacers who are currently breaking into the team. Sri Lanka also has a separate fast bowling coach who works solely with the national team bowlers. Currently Champaka Ramanayake is carrying out this role. So one bowling coach works with the bowlers in the pipeline, while the other works with those who have made it to the national team. Now compare their structure with ours. Our high performance unit, which has had its fair bit of success, has been functioning in on and off mode (BCB has made an excellent decision in appointing Richard McIness to resume the work of the unit). We never had a specialized pace academy, and have shuffled our fast bowling coaches between national team and academy. Fast bowling coaches have also come and gone, often we have had to wait months to replace those who have left. All of them worked intermittently and none of them worked according to a long term strategy. One day a coach was working with youngsters, next day he was asked to assist national team players. So what happens to the youngsters when the coach is on national duty and vice versa? The Sri Lankan academy is not equipped with world class infrastructure and doesn’t possess speed guns, biometric specialists and high tech cameras like you get in Australia or England or South Africa. Its success can be simply attributed to a clear and concise long term strategy, careful planning and perseverance of their coaches. Sri Lankan fast bowling coaches consider physical attributes as the most important criteria in the selection of fast bowlers. According to them a fast bowler can have pace, can have skills but they will not last if they don’t have the right physical attributes. Consider the plight of Mashrafe Mortaza. When he made his debut he could bowl at 145 kph and generate good swing and bounce-something we were not used to seeing in Bangladeshi bowlers. In fact, Mashrafe was the only Bangladeshi bowler who could force batsmen to play on their backfoot! Without any doubt, Mortaza is Bangladesh’s best ever fast bowler. Imagine if he didn’t have any of these critical injuries, where he could have been today! Generally Sri Lankan youngsters are fitter than Bangladeshi youngsters. How? Again this starts early. Sports are an important part of schooling. Each youngster is likely to pursue 2-3 sports simultaneously in their school life before they decide on cricket-basketball, swimming, rugby, football, athletics, and volleyball and so on. Dilhara Fernando for instance was a basketball player who was lured into the school cricket team because of his height. Pursuing so many sports leads to the youngsters becoming better athletes. Think about it- a young school boy in Colombo will stay back after school for mandatory swimming or cricket, while a Bangladeshi boy will be home getting ready to go for tuition classes. Fitness is also a habit. It has a lot to do with diet, daily workout and exercise. Fitness is also an end result of discipline and work ethic. Several years ago, when I was working in Colombo there was something I used to observe every day. Every day on my way to work at around 7:30 AM, I used to see Chaminda Vaas jogging in the streets. On my way back from work at around 5:30 PM I would see him again jogging in the same area. Jogging twice a day was a part of his daily routine and an example of his commitment to fitness. Now can you imagine any of our bowlers doing this? I have already mentioned Sri Lanka’s fast bowling unit has specialized fitness coaches to look after bowlers. But sometimes even with the best fitness training and care you can’t prevent injuries. This is where the unit again plays a key role. They take the responsibility in rehabilitating the bowler and gradually helping him get back to international cricket. They also work with the players so that that they avoid injuries. When Lasith Malinga first made it to the national team he was around 52 kg. The coaches knew if he had to maintain his speed he needed to work on his physique. A bowler with such weak frame usually gets injured in a matter of time. With the help of his coaches, Malinga developed a stronger and more muscular physique and now weights around 72 kg. Usually fast bowlers speed declines as he grows older. Malinga became quicker! 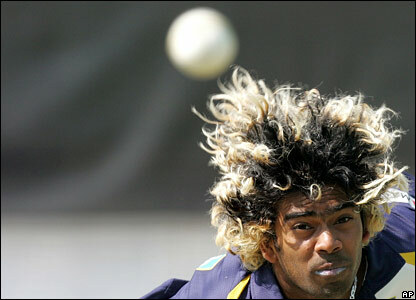 Malinga bowled the fastest ball of Wold Cup 2011, a 155.7 kph delivery against New Zealand. Malinga had his fair share of injury problems which has even forced him to retire from the longer version. But he still remains very strong and fit enough to deliver in the shorter version. Nearly two decades ago, in the fishing town of Rathgama (Sri Lanka’s south-west coast), a young boy started playing cricket in the beach. Despite his protests of his mother, the boy would rush to the beach every day after school to enjoy a game of cricket. The boys played tennis ball cricket in the sandy beaches against the sea breeze. To bowl quick in these conditions, the boy had to adapt his action and develop a strong upper body. At the age of 18 he held a leather ball for the first time in a school match. Within 3 years time from that time, Lasith Malinga broke into the Sri Lankan national team. There has been no looking back since. In a short time Malinga became an iconic figure, match winner and the undisputed spearhead of the Sri Lankan bowling attack. Malinga is not alone. Legendary West Indian fast bowler Michael Holding also starting off with beach cricket. How was West Indies able to produce so many fast bowlers? There is a theory that they all benefitted from playing in the sand early on. Tape tennis balls played a key role in Pakistan’s development of fast bowlers. Every Pakistani youngster starts playing cricket with a tape tennis ball (whether on the streets or nets). To be successful with the tape tennis ball they need raw pace. So they adapt to a quicker arm action and use their every bit of strength. Sometimes even pace is not enough to prevent them from being whacked around the park. So they learn how to swing, learn how to bowl yorkers and slower deliveries. Every Pakistani fast bowler (From Imran Khan to Mohammad Amir) will say this is how they started their cricket, and that tape tennis played a role in their development. Now what is the lesson in this for Bangladesh? Promote beach cricket, promote tennis ball cricket? Not exactly. The lesson is we may not be able to find a Malinga in the nets of Abahani practicing with a leather ball. We need to widen our search parameters. We need to look at villages, rural school cricket and often resort to the unlikeliest places to find a future fast bowler. Sounds easy in theory, but how can we implement this? This is where the decentralization of cricket will help. Individual’s delegated responsibility of promoting cricket in the different regions must scout for such prospects and bring them into the system. This has been one Sri Lanka’s key success factors-the ability to discover and bring in young talent from around the country. not time tellers.” We need Mustafa Kamal, Richard Pybus, Richard McIness and all other cricket officials to develop such a clock or a system which will enable us to uncover and develop talent. The development must not stop when a coach or president leaves. All of a sudden BCB has made a flurry of excellent decisions-BPL, Pybus, McIness, National Cricket Academy. Let’s hope such positive initiatives continue and the next one is the development of a pace academy. It will take our cricket ahead a long way! This page has been viewed 7351 times.